Art Edit is a magazine about living with art and interior design. Packed with tips and inspiration, Art Edit features Australian artists, interior designers and art galleries. 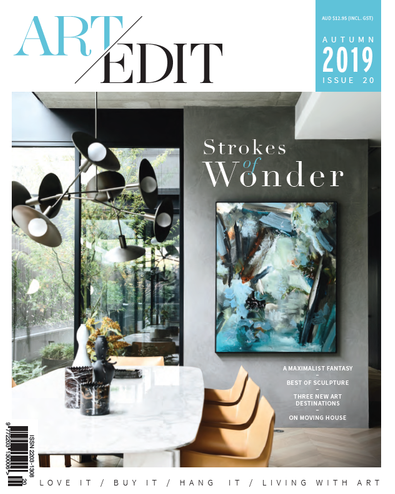 In every issue of Art Edit you'll also find practical advice about finding art for your home and how to install and style it. A beautiful and creative home starts with art. In this issue we chat to still life painter Elizabeth Barnett and introduce the hot new artists on our radar. We take you through the how to's of buying art outside the gallery space, and present three incredible still life artists to add to your collection now. Our regular gallery panel and design council are also bursting with ideas on how to hang and style art in your space. It&apos;s a bright and breezy new Australian art-based publication with an abundance of on-point information about local talent. The magazine combines interesting features and information on galleries and where to buy with stylish page design, so you&apos;re never short on inspiration - even if you&apos;re an art-world novice! Highly recommended.